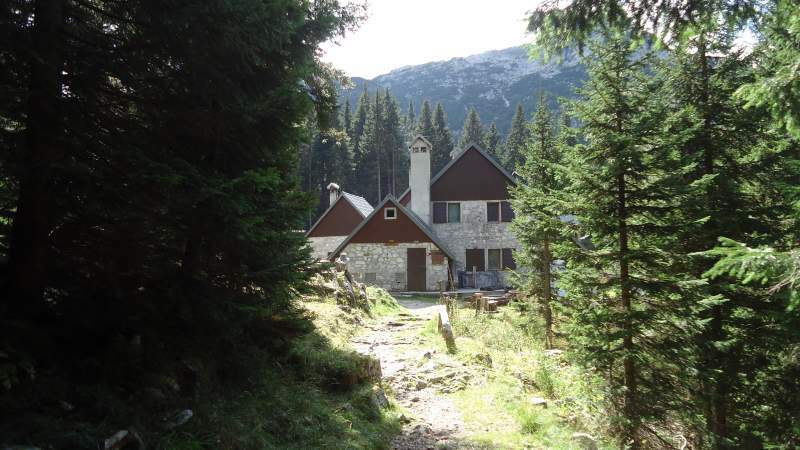 If you plan climbing Krn in the Slovenian Alps from the north side, you have several attractions that include three mountain huts, a beautiful lake, and a WWI front area with a cannon above 2000 meters of the altitude. The lake and the Krn summit behind. Krn (2244 m, 7362 ft) is a mountain in the Julian Alps, Slovenia. The mountain looks very different from different sides and the mountaineering routes go over very different terrains. I have passed the north route and here I give some first-hand information about it. Elevation: 2244 m (7362 ft). 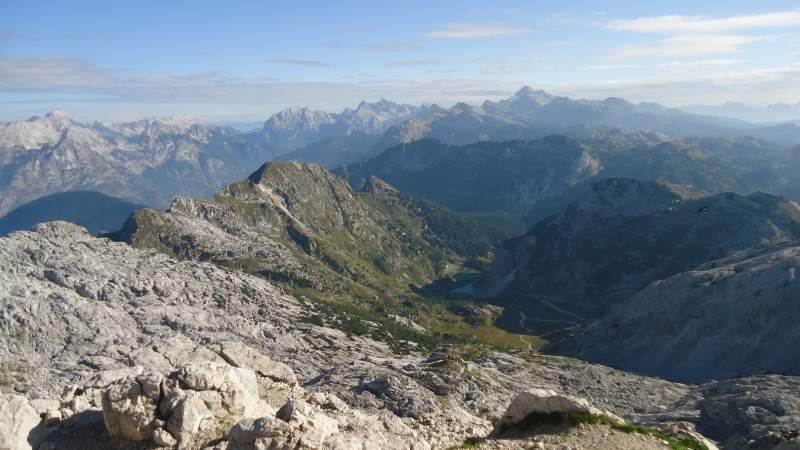 Mountain range: Julian Alps, Slovenia. The green arrow – the start of the route & parking at the first hut, Dom Dr. Klementa Juga. The blue arrow – the second hut, Dom Pri Krnskih Jezerih. The gray arrow – the lake. 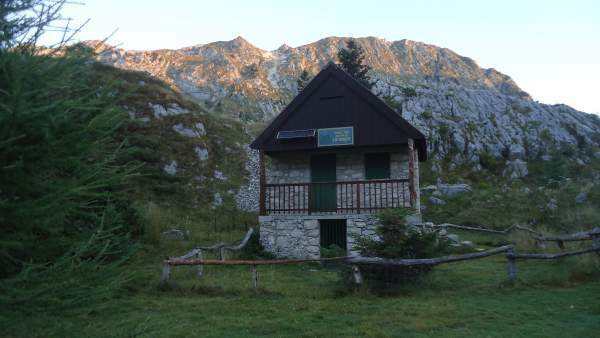 The yellow arrow – the third hut under the summit, Gomiščkovo Zavetišče na Krnu. 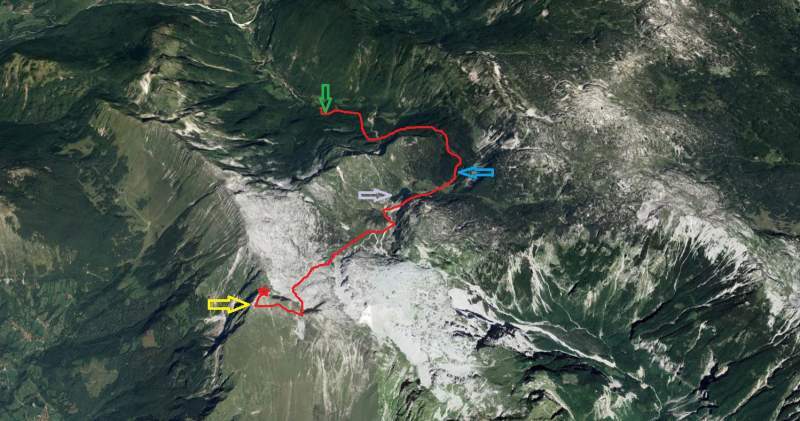 The route from the parking to the summit. So you drive from the Soca (Soča, pronounced as Socha) river valley after passing a bridge and continue along the Lepena valley. 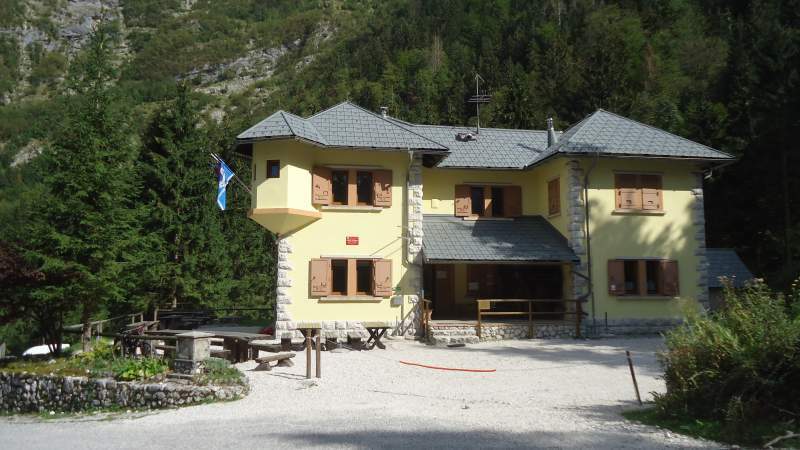 If you are coming from Bovec (pronounced as Bovets) you will first pass a camping and the turn to the Lepena valley the next one after that. You have a narrow but good asphalt road all the way to the hut Dom Dr. Klementa Juga which you see in the picture below, at the elevation of 700 m. It was closed when I was there, not sure why. Now you see the height difference you have to pass, it is 1544 meters from the parking to the summit, and the route is long, so do not underestimate this relatively low mountain. The hut (Dom Dr. Klementa Juga) at the end of the road. 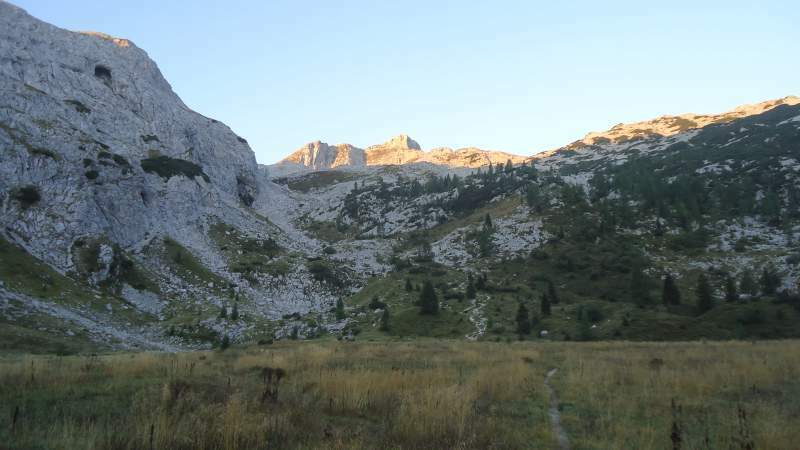 From the parking, you continue up through the woods, the route zigzags all the time until you get at a pass and then you descend to the hut with the name Dom Pri Krnskih Jezerih (the meaning of the name is ‘the hut at the Krn lakes’). This section will take you around two hours. In my case, I started at 4:20 am and arrived at the Krn lakes hut at 6:10 am. It was dark all the time, did not have any idea about the surrounding area, and I was listening to the noise of some male dear or perhaps ibex somewhere in the woods. Only on the way back, I was able to see this part of the route, so here is a photo which shows a part of it. 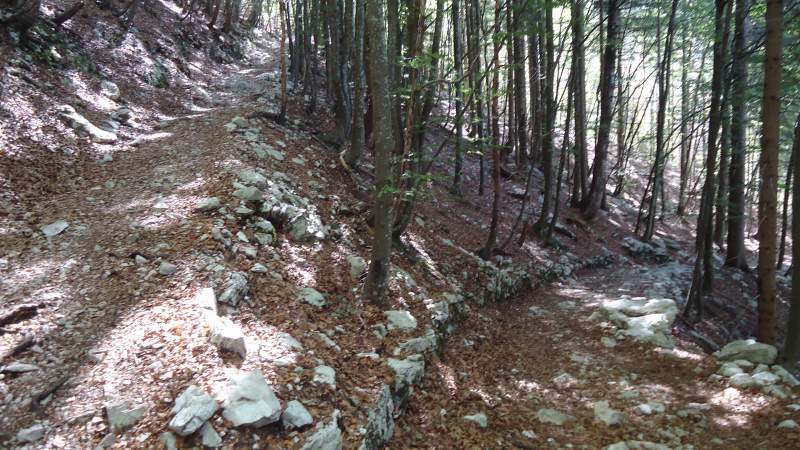 The lower part of the route through the woods. 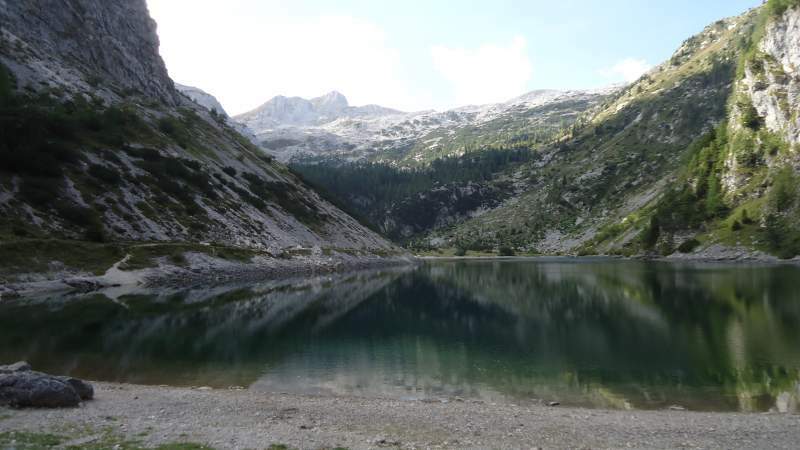 When I arrived at the Krn lakes hut (Dom Pri Krnskih Jezerih), it was still completely in the dark, so the picture which you see below is taken on my way back. This is a beautiful group of stone objects surrounded by a thick forest, at the altitude of 1385 meters. It is worth visiting with friends and families even without continuing the trip up. The hut at the Krn lakes. 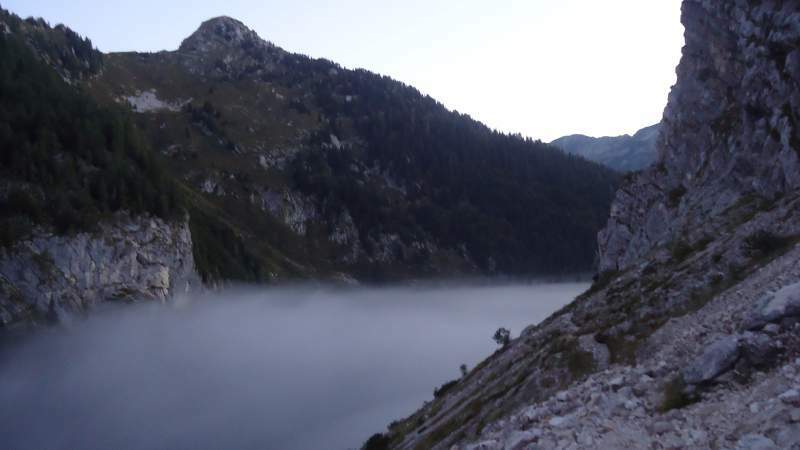 I just continued and took the route higher above the lake, there was a cloud of fog sitting above the water so the lake was not visible at all, this is the picture I took in so early hours, blurry a bit but it shows the atmosphere. There was nobody around from the moment I started the tour and it remained so all the way to the summit. The fog cloud above the lake. 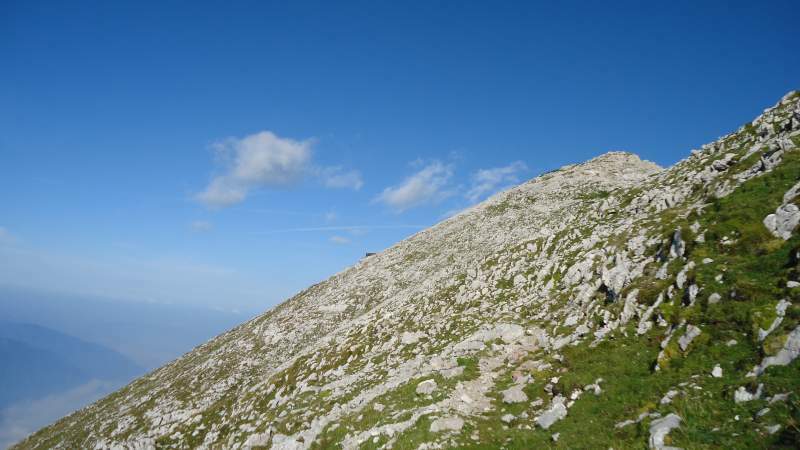 The first view of the summit of Krn. A hunters’ cabin above the lake. View back towards the lake under the fog. 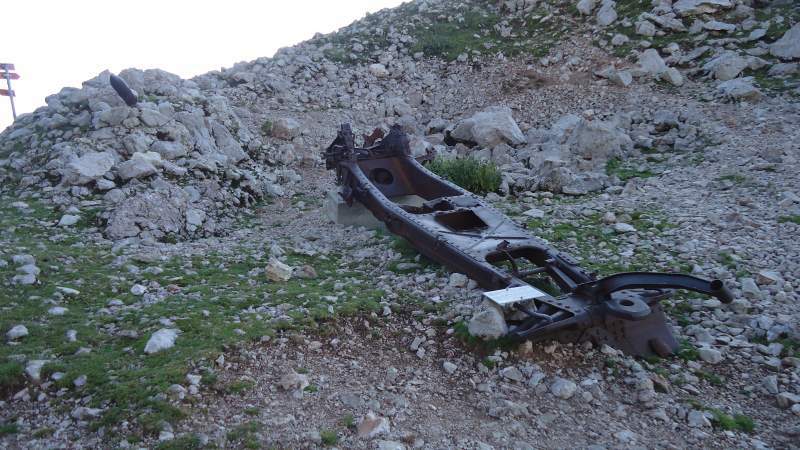 The piece of a cannon from the WWI. This is the final part below the summit, the south slope and the hut is barely visible. Now, I should continue with the cliche statements about stunning summit views, etc. Is there any summit without stunning views? So here are a few photos instead, judge yourself, the north side and the south side. The latter is a long and mild grassy slope so you can get to the summit from the south side without following any route at all, this is how local sheep do this. They are grazing everywhere around and the summit is full of their droppings, so you have no place to sit, and it smells very bad. But if you disregard such details, as I did, then you will enjoy the mountain and the views. The summit view of the north side route, the lake is far below. The highest Slovenian mountains are in the background, Triglav included. This is the south side seen from the hut. There is a southern route that follows the ridge which you see here. I only passed the north side route and have no first-hand experience with other approaches. So as usual, I refrain from giving any information until I pass the route myself. Those of you who climbed the mountain from the other side are most welcome to comment below or to add an article, I have an open invitation for guest authors. The only condition is that this is a reliable personal experience, no stuff collected from the Internet. But you have seen the picture above, this is the south side and there is a route along the ridge, clearly visible. 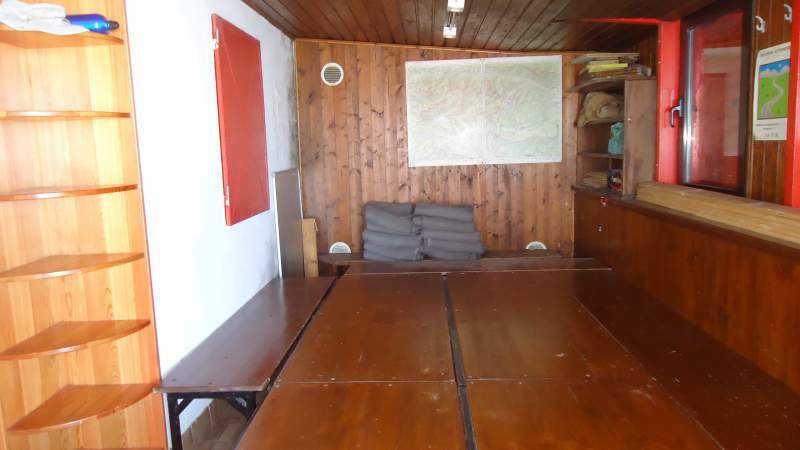 The hut was officially closed, but there is a winter room which was open. Below you see the hut from outside, and the view in the winter room. There is a place for 6 – 8 people or so, and blankets are available. No stove and no water around, just to know if you plan to stay the night here. 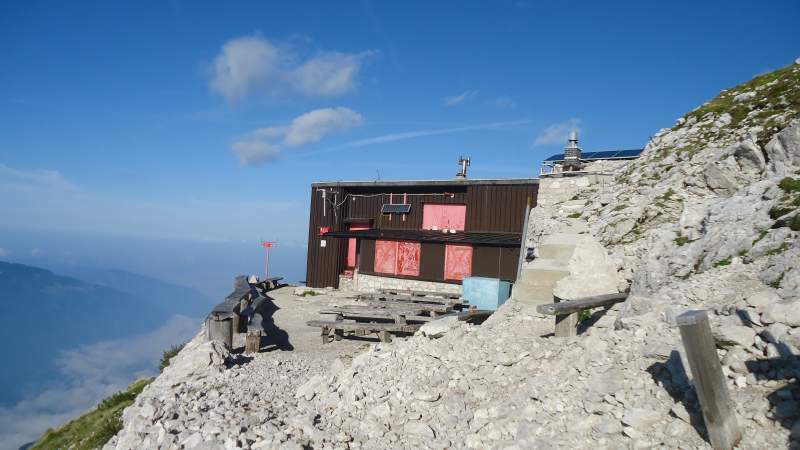 The Krn summit hut, some 200 meters below the summit. The first hut built here was founded in 1901. It was destroyed by the snow a few years later. Then there was WWI and this was a front zone. In 1951 a new hut was built and it was named after a man (Ervin Gomišček) who died there accidentally in 1950. It was renovated in 1985. As it was closed I could not see how it was inside and what it offers. But as I understand it can accommodate quite a number of people, have seen on a site they mentioned 42 places in a shared room. This is a walk-up route, so you need nothing particular regarding the equipment. Normal hiking shoes or boots will do the job. If you need any, visit my page with boots and shoes. As usual, I used a pair of trekking poles. You might want to have a hat so check some here, sunglasses, and a daypack. But check also my text about normal gear for the Alps. Observe that this is a long route and after the lake hut, you will have no water, so carry enough for a day tour. At one point below the summit pass, there is a place with the word Voda (this means water) written on the rock. But I was there in September and it was bone dry. You can have a lunch at the lake hut, so plan your day as it suits you best. The car parking at the beginning of the route was free, there are no fees in general. The snow height in April each year. Climbing the Krn mountain was a pleasure, I started my tour at 4:20 am and I was at the summit at 9:40 am. 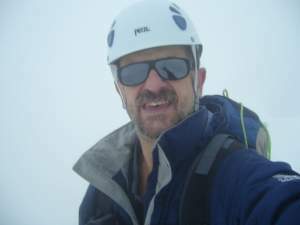 So it took me a bit more than 5 hours but this includes a rest at the summit hut for 15 minutes or so. This is a non-technical tour without any exposed section and anybody in a normal physical condition and with a bit of stamina can do it. I did this tour before going to Jalovec so keep reading about this more demanding tour. 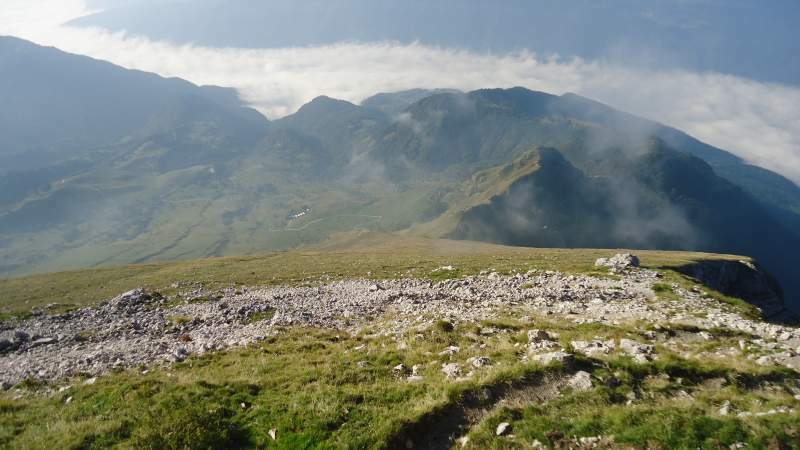 If you are there, then you might want to climb Prisojnik, Mala Mojstrovka, Lipnica, and the big one, Triglav of course. But see also Mangart, and Jof di Montasio (Montaz) which is across the border in Italy, I climbed them all so let me know if you need some extra info. Thank you for reading. 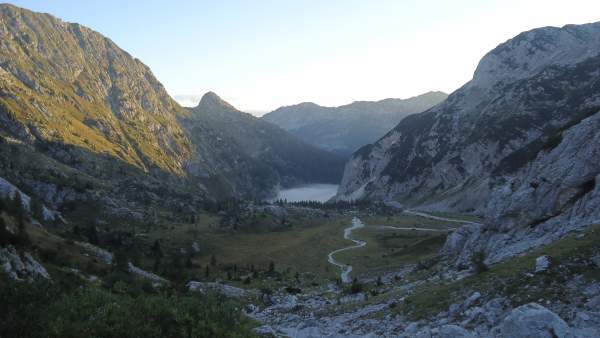 Any experience in climbing Krn or some of the Slovenian mountains around? If so please share it here, there is a comment box below.